Seriously, how did I not think of this in college? I was the master of making whole meals out of ramen noodles, but I never thought of using them as sandwich components. 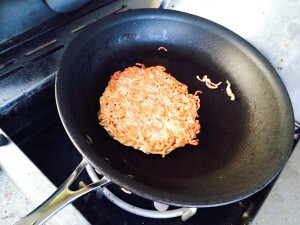 Well someone smarter than me did think of it and now ramen burgers are starting to pop up all over the place. 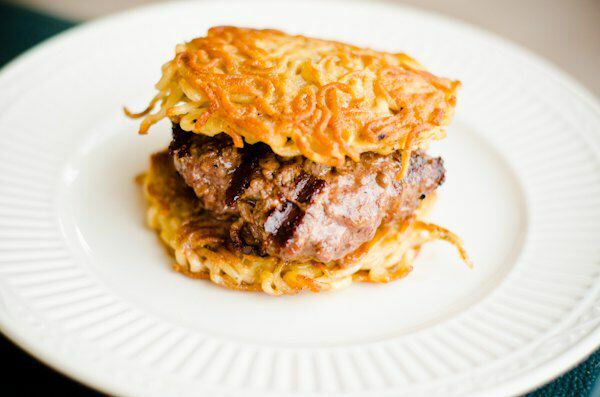 A ramen burger is basically a normal burger with curly hair consisting of a compressed ramen noodle bun. Like any other burger, there are many combinations of toppings that go great with this carb and protein bomb (did I mention how dense this thing is? Wow). I’m not going to go in to toppings at all this time, I’m just going to focus on the “ramen” in ramen burgers (the buns). Full disclosure here, I don’t enjoy making these things. I find the whole process to be a pain in the noodle but people seem to love them and they make a great impression at cookouts, so stick them in your grilling arsenal for when you are trying to impress a crowd. 1Cook the ramen noodles per the directions on the package (including the beef flavor packet). I like to cook them to ALMOST done so that they aren't all gooey and gummy. 2Once cooked, strain the noodles and let them cool for about 10 – 15 minutes, so we don't create scrambled eggs with the next step. 3Beat one egg in a bowl and then add to the noodles. Fold and mix the noodles and egg to combine thoroughly. 4Grab two identical bowls whose bottom is the size of the bun you are trying to make. My sons really dig ramen noodle sliders, so I use a small bowl. 5Spray the bottom of the bowls with non-stick cooking spray and then spread enough noodles in the bottom of the bowl to around 3/4 inch deep. 8Place the bowls in the refrigerator for at least 30 minutes to allow the noodles to set into our bun shape. 9Heat a tablespoon of butter in a pan over medium-high heat. 10Flip the ramen noodles out of the bowl and in to the hot pan. 11Cook for 5 minutes on the first side. We want a nice brown crust on each side of the "bun" for texture. 13Flip the noodle puck over to the other side and cook for another 3 - 4 minutes to cook through. 14Repeat to cook the remaining buns, placing each ramen bun onto a plate to cool. 15Add your hamburger patty, toppings and serve!